Dietitians can play a huge role in helping their baby boomer clients at risk for cardiovascular diseases harness their high LDL levels by way of diet modifications and increased fitness. Americans are enjoying longer, more productive and active lives and may not feel “old” in their 40s, 50s, or even 60s. But adults in this age range (baby boomers) are at increased risk for cardiovascular diseases such as coronary heart disease (CHD), in part because blood cholesterol begins to rise around the age of 20 until about the age of 65. Data from the National Health and Nutrition Examination Survey III (1988-1994) further support this, showing that people between the ages of 45 and 64 have average LDL cholesterol levels that qualify as well above optimal (borderline high).1 Because this group makes up more than 25% of the U.S. population, RDs who work with adults are already talking a lot about eating for heart health. 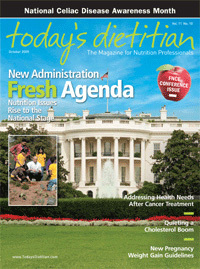 A hunt for the best-available, evidence-based diet and exercise guidelines for lowering high cholesterol will lead to the Third Report of the Expert Panel on Detection, Evaluation, and Treatment of High Blood Cholesterol in Adults (Adult Treatment Panel [ATP] III) of the National Cholesterol Education Program (NCEP). Helping baby boomer clients and patients translate these science-based recommendations into practical advice for everyday living is crucial to helping them maintain heart health. Before jumping into strategies for healthier eating with patients, it may be useful to assess their baseline knowledge of cholesterol. Even though—or perhaps especially because—cholesterol is now a familiar term, you may need to remind patients why cholesterol matters to them. • Cholesterol is everywhere in the body, including our cell membranes, and is useful for making hormones, bile acids, and vitamin D.
• Although the body needs cholesterol, it can make as much as it needs on its own (ie, no dietary cholesterol required). • Cholesterol, which is fatty (ie, lipid), teams up with proteins to travel through the blood. These traveling packages are called lipoproteins. • Lipoproteins get a lot of press as low-density lipoprotein, or LDL, and high-density lipoprotein, or HDL, cholesterol. • LDL travels to tissues, including the arteries. In fact, most of the cholesterol in the blood is LDL. • HDL takes cholesterol from tissues and transports it to the liver, which readies it for removal from the body. • Extra blood cholesterol can sometimes become trapped in artery walls, build up into plaques that narrow blood vessels, and harden arteries, a condition called atherosclerosis. • Hardened arteries can surface anywhere in the body. When they’re near the heart, the partially blocked arteries can reduce blood flow, which reduces the muscle’s supply of oxygen and nutrients, causing chest pain (angina). • Unstable plaques sometimes burst, prompting blood clot formation over the unstable plaque; blood flow is subsequently blocked, causing a heart attack. • High blood cholesterol is a major risk factor for heart disease. • Lowering LDL through diet can help prevent heart attacks and can slow, stop, or even reverse plaque buildup. • A heart-healthy diet is a strong foundation for cholesterol management and should be maintained even if medications are added to the overall therapy strategy. The full NCEP report (see Resources below) provides a heavily referenced rationale for why LDL cholesterol is the primary target for reducing the risk of heart disease and can be used to support any of the previous simplified bullets. This may be especially useful when working with baby boomer patients. “This age group is generally assertive. They go after health information from a variety of sources. They tend to be educated and do their homework before seeing a healthcare provider,” says Jane Nelson Worel, RN, MS, APNP, president of the Preventive Cardiovascular Nurses Association. Once patients are motivated to make healthy changes, it’s time to help them implement the NCEP TLC diet. Its recommendations for lowering high cholesterol (also suitable for maintaining optimal LDL cholesterol levels) focus on consuming less than 7% of calories from saturated fat, less than 200 mg/day of cholesterol, 10 to 25 g/day of soluble fiber (20 to 30 g/day fiber overall), and 2 g/day of plant stanols/sterols. The overall TLC diet calls for approximately 15% protein, 50% to 60% carbohydrate, and 25% to 35% fat. In addition to limiting saturated and trans fat, the TLC diet allows for up to 10% of total calories from polyunsaturated fat and up to 20% of total calories from monounsaturated fat. Sample menu plans with nutrient analyses are available in the diet appendices of the full NCEP report. When it comes to individualized diet counseling, ATP III calls out RDs as the experts who can provide acceptable substitutions for patients’ favorite foods that contribute to high LDL cholesterol, assess their readiness to change, and reinforce dietary principles at each follow-up session. The TLC guidelines also recommend daily moderate physical activity that burns about 200 kcal/day, such as 30 to 40 minutes of brisk walking, swimming laps for 20 minutes, or social dancing for half an hour. For example, we know that it’s useful for our label-reading patients to understand that the recommended limit on saturated fat is 15.5 g/day for a reference 2,000-kcal diet. But we can also tell patients that an easy way to avoid saturated fat is to be aware of its common sources (eg, meat, poultry, dairy, some tropical oils). We know that dietary cholesterol comes only from animal products; that the fruits, vegetables, and whole grains we champion are also great sources of heart-healthy soluble fiber; that plant stanols and sterols are found naturally in small quantities in plant foods but may be more accessible in functional foods (eg, certain vegetable oil-based soft spreads, orange juice); and that fats in the diet should be protective polyunsaturated and monounsaturated varieties from foods such as fatty fish, pistachios, avocados, and vegetable oils. Saturated fat is the main dietary cause of high blood cholesterol. Repeating this statement to clients is worthwhile because all of the attention given to trans fat may confuse the issue. While it’s important to point out that there’s no need for damaging trans fats in the diet (the American Heart Association recommends no more than 1% of daily calories, or 2 g/day, for a reference 2,000-kcal diet), patients must understand that cutting back on saturated fat can have an enormous impact. Food sources include beef, veal, lamb, pork, lard, poultry, butter, cream, dairy products made from whole and 2% milk, coconut, cocoa butter, and tropical oils (eg, coconut, palm, palm kernel). Animal products also contain dietary cholesterol. Soluble fiber has been shown to help lower blood cholesterol, and both soluble and insoluble fiber contribute to overall digestive health. Fiber foods include fruits, vegetables, legumes, and grains, which offer patients plenty of options. Examples of good and commonly available choices are apples, bananas, oranges, berries, peaches, and pears; broccoli, Brussels sprouts, carrots, cabbage, cauliflower, and beets; beans, lentils, and peas; and barley, oatmeal, brown rice, and whole grain bread. A quick tip to share with label-philic patients is to look for at least 1 g of soluble fiber per serving or 3 g of total fiber per serving. Also, patients may feel more comfortable transitioning to a high-fiber diet if they incorporate fiber-rich foods into meals and snacks throughout the day and drink six to eight 8-oz glasses of fluids per day. Polyunsaturated fat of the omega-3 variety may reduce the risk of heart attack, according to prospective data and clinical trial evidence, though researchers are still exploring the exact mechanisms.1 Both the American Heart Association and ATP III recommend consuming omega-3 polyunsaturated fats from fatty fish, vegetable oils, and nuts. Good food sources include salmon, tuna, and mackerel; soybean and canola oil; and walnuts, pistachios, pecans, and almonds. While targeting LDL cholesterol is a great place to start, heart-health experts acknowledge that baby boomers face additional challenges. “In previous generations, growing older was the sole leading ‘risk factor’ for diseases like coronary artery disease, type 2 diabetes, and certain cancers. For baby boomers, we have an epidemic of obesity that is a second major contributor to these same diseases,” says Martha A. Belury, PhD, RD, a professor of human nutrition at Ohio State University. Other major risk factors that impact LDL goals are cigarette smoking, high blood pressure, low HDL cholesterol, and a family history of premature CHD. Maybe more than in previous generations, the concept of looking and acting “young” may be helpful for persuasive counseling. “Baby boomers are not ready to get old, look old, or act old,” says Belury. The National Heart, Lung, and Blood Institute plans to post updated guidelines for reducing cardiovascular risk in March 2010 for public review and comment; the final release is scheduled for summer 2010. While prior iterations (1988, 1993, 2001, and 2004) separated guidance by cholesterol, hypertension, and obesity, the 2010 report will combine the three areas into one practical guide for cardiovascular risk reduction. The existing individual guidelines will also be updated. As RDs know, the best advice means little unless patients follow it. With the same understanding, part of the charge given to the expert panel for the integrated guidelines is to create user-friendly guidelines for clinicians and patients. As they advance toward older adult status, baby boomers should maintain treatment for cholesterol management. “We are experiencing an ‘undermanagement’ due to age, in which some MDs are ignoring hypercholesterolemia in the older population due to thinking there is not necessarily a benefit from intervention,” says Hope Barkoukis, PhD, RD, LD, an associate professor at the Case Western Reserve University School of Medicine. — Maggie Moon, MS, RD, is a nutrition writer and dietitian based in New York City. 2. Grundy SM, Cleeman JI, Merz CN, et al. Implications of recent clinical trials for the National Cholesterol Education Program Adult Treatment Panel III Guidelines. J Am Coll Cardiol. 2004;44(3):720-732. • to increase the proportion of people with high blood cholesterol who adhere to their cholesterol-lowering regimen.